Volunteers of America graduate Amy Kalber spent years struggling with her addiction, but today, she has been sober for more than five years after receiving Volunteers of America Mid-State's life-saving services at Freedom House, a residential treatment program for alcohol and/or drug dependent pregnant women and women with young children. 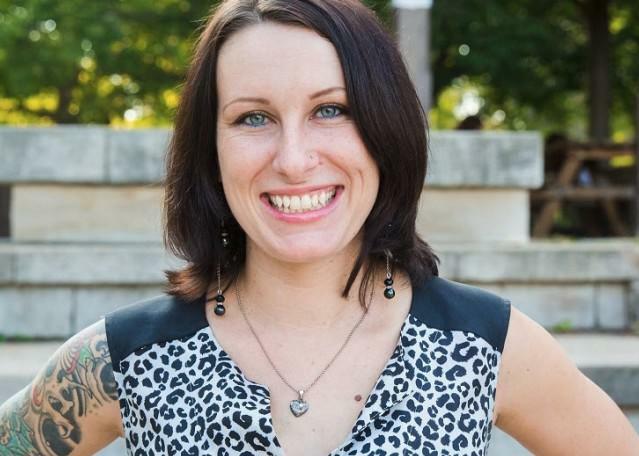 Amy, who is now working towards a social work degree at the University of Louisville shared that during her recovery, Volunteers of America helped her rediscover who she is as a person at her deepest core. "I showed up to Volunteers of America completely broken. I didn't know who I was, if anything could be salvaged. I had no idea that I had just been placed exactly where I needed to be. "I can stand up with complete pride and tell each and every one of you that today, I am a productive member of society who finally gives more than she takes, and I work with others in the hopes of passing this kind of life on. This is my story because Volunteers of America answered my call." Watch the video below to learn more about Amy and, another client Megan, and how Volunteers of America helped them fight and win their battles against addiction. Amy: I was so broken. There were so many pieces to put back together as far as trying to figure out how to fit into society. I've been basically absent from the world for 17 years. I was 11 when I started drinking. And there was never a sense of returning to normalcy. This is how I got to Volunteers of America. I used the whole time I was pregnant from then on. We were actually living in a junk yard, in a house with no electricity, and no water, nothing. And we'd been living there for a few months. I went into labor there. Jordan was very sick when he was born. He was in the NICU for seven weeks, withdrawing from alcohol and some other stuff. When I came out, and came out of detox, I just drank. And drank, and drank. And I remember praying, I remember talking to God in the mirror the night before I was supposed to go to Volunteers of America, and I was begging God, "Please just get me there. Please let that place take me. And if they take me in the morning, I won't drink anymore." And they took me in the morning. This is Volunteers of America Freedom House. And this is where our kids played, and where we came to meet in between. We did classes over in this building. And I always tell everybody that Volunteers of America gave that to us. And they advocated for us. We did our parenting classes, relapse prevention classes, life skills. Megan: Our family would come in, and do family education classes in that building as well. Megan: Whenever I got sober, I was so broken, and so beaten, that I didn't trust anyone. I didn't trust myself. And I think she was probably the first person ... You were the first person that I trusted. I was in an apartment that I was evicted from, they just hadn't physically moved me out yet. I had no electricity, no running water. My family hadn't spoke to me in several months. Every morning that I woke up, I was angry that God let me live. But I was too big of a chicken to take my own life. And then I came here, and I was scared to death. And I needed a facility like this to tell me to get up, and take a shower. To tell me, "Hey you need to wash your clothes. You need to make your bed whenever you get out of bed." I had no idea. I was living on the streets so unmanageable for so long, that I needed people to tell me how to live. That's what this place gave me. For the first time in my life, while I was living here, I found it more rewarding to be able to be present for my child, then to be able to chase that next drink. It's a really spiritual moment for me. My older daughter was present through my addiction, and I just had accepted that that was gonna be my life. But on the inside, I knew that I was meant for so much more. I was so newly in my pregnancy that nobody wanted to keep me anywhere. They said, "We'll just have to put you back out." And, that's whenever they decided to take me. If it wasn't for Volunteers of America, I might have possibly been out on the streets. Because they served pregnant women. And there's not many places in the state of Kentucky that offer that. Amy: I got Jordan back when I was nine months sober. And then we had the new baby. And sissy, Rory, has never had a drug or anything in her system. She's the first sober baby, and she's never seen us drunk or anything. Megan: Me and Amy have been through it together. And when I'm able to come back to Louisville, or talk to her on the phone, and I see that she is this amazing mother, and she's this amazing friend, and such a success. I'm so proud. Being sober teaches you that you don't think about yourself, that you think about other people. And it's because of her story, and the strength that she has, that sometimes I feel like I'm able to do what I'm able to do. Her story is a true example of faith, strength, courage, and hope. I feel really privileged, and honored, and grateful, 'cause there's a million other people out there with stories just like mine, that deserve to be heard. They deserve to be loved just like anybody else.